Our high school boosters organization has monthly meetings, typically an evening gathering on the second Monday of the month. In February, our meeting was moved to a Tuesday, which happened to be Valentine’s Day. 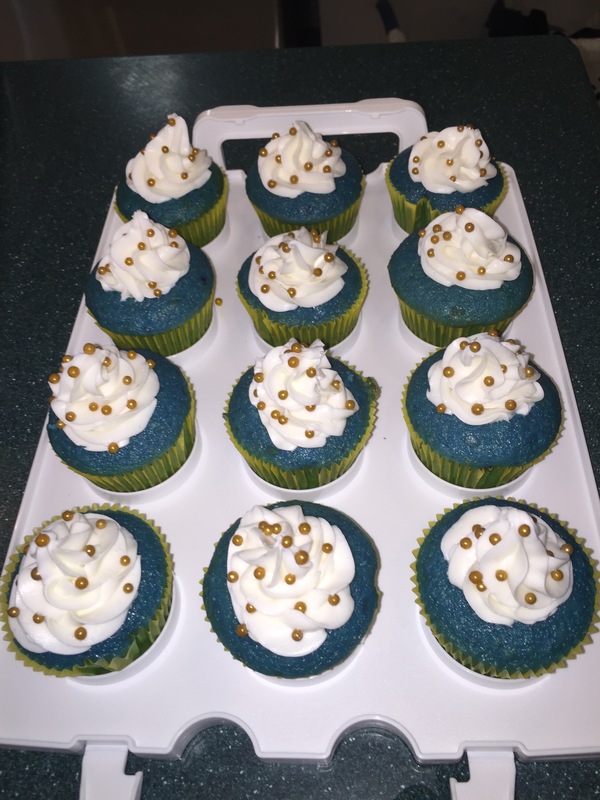 I decided to make some cupcakes for the group to enjoy. Because it was a weeknight, cake mixes and canned frosting are my go-to, so I made triple chocolate fudge cupcakes with a classic white frosting. 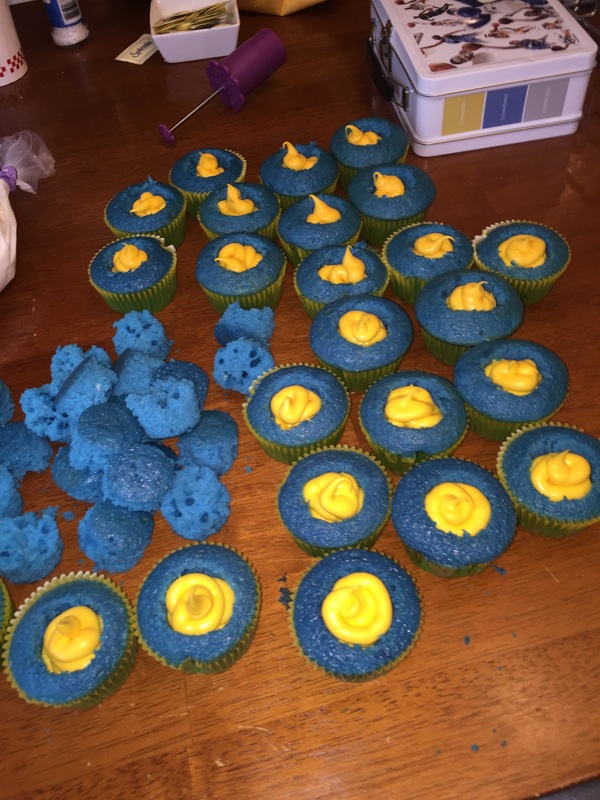 To decorate the cupcakes, I had made royal blue and yellow heart-shaped candy melts to place on top, because these are the high school team colors. I then dipped the edges of the cupcakes in Valentine pearls. You can always find a group of people to share the love with! I can’t remember when I started doing this, but a few years back I began sending homemade cookie care packages to friends’ kids who were heading off to college, with a note of encouragement. I remember when I started college, my mom sent me a care package of cookies and a note. It made whatever was happening during that transition to life away from home just a little bit sweeter. As my own boys get older, there are more and more people I know who have kids heading off to college. Even though I send the packages via USPS priority mail second day delivery (yes, I lie when they ask me if there is anything perishable in the package – don’t rat me out!) for only $6.80, this year I spent over $60 on mailing out the packages. This year’s list of recipients included kids who were first born, youngest, and middle children. For many of the kids, I feel like the moms need the treats more to cope with a first born leaving or dealing with the now empty nest. Most of the kids had attended the local high school. I made chocolate chip cookies (I use milk chocolate chips instead of semi-sweet) and also royal blue and yellow lion paw candy melts. These included the same chocolate chip cookies and “paws” candies. For Lana – it was blue/gold paws for her high school team the Lions, and orange/black paws for her new college team, the Bobcats. All in all, $60 well spent. Best of luck to all the students! My mom hosted Christmas dinner for my dad’s family this year. Mom provided the main dishes — tenderloin and stuffed ham (definitely an acquired taste that I never acquired) — and homemade rolls. Everyone else was bringing side dishes and I offered to make a cake. I saw a box of Duff Goldman’s Candy Cane cake and thought it would be a fun thing to try. I didn’t expect to get the exact look of the picture on the box (Duff’s a pro, after all). I do believe that you would get something closer to the picture if you doubled the recipe from one box to two. That way the layers of the cake would have greater height and the candy cane look would be more visible. I frosted my cake with red-tinted vanilla icing in between the layers, white vanilla on top, and a combination of the red and white on the side. My goal was to make a candy cane stripe on the side of the cake. I used two 1A tips with red icing in one bag and white icing in the other. I alternated the color of the icing as I piped each layer around the circumference of the cake, starting from the bottom up. I then used an icing smoother, but the cake plate my mom gave me had a lip, so I couldn’t get the smoother flush against the cake. I opted for a long knife instead. The mix came with some crushed candy canes for the top, but I opted for red sugar sprinkles instead. For peppermint flavor, you could add some peppermint extract into the cake mix instead (1/4 teaspoon would be plenty – peppermint extract is strong!). Here’s the inside. Because the height isn’t that tall, it’s hard to see the candy cane stripes on the inside, even though the technique used to get them does work. Again – doubling the mixes used should help with that. I will definitely try this candy cane/zebra technique with future cakes as it makes a nice surprise when you cut into the dessert. This year, our larger work group decided to have a Thanksgiving pot luck lunch. People signed up to bring entrees, sides, and desserts. I was on dessert detail — no surprise there, right? I made a chocolate cupcake because I thought that would taste best with the Reese’s Pieces. The frosting I used was a milk chocolate. The inspiration cupcake called for 8 brown Reese’s Pieces around the outer edge. When I did the math — Sister Frances Miriam would be so proud! — that was 192 brown Reese’s Pieces. When I emptied the bag, it was clear I wouldn’t have that many. So I started with six around the outer edge, five in the middle, and four on the inside. As I got toward the last turkeys, I modified the outer edge to be the orange colored Reese’s Pieces because I had the most of those. I actually had to use brown M&Ms for the last turkey because I ran out of brown Reese’s Pieces. If you are making these for a party where you may not know everyone, remember there may be people with peanut allergies (I checked ahead of time). To be safe, use M&Ms for the turkey feathers to avoid problems with peanut allergies if you aren’t familiar with the guests on the list. I found the mini-red M&M didn’t stick well like in the inspiration recipe, so even though I had purchased mini M&Ms, I didn’t add that element at all. I don’t think it took anything away from the final product. I didn’t use candy melts for the beak — I used left over royal icing from pumpkin cookies and dipped them three times to get the “beak” portion fully covered. I used white frosting as the background for the mini M&M eyeballs because it was one less step in the process (no melting of candy). I added some multi-colored jimmies for additional visual interest. The pot luck was great. So many wonderful foods, shared with wonderful colleagues. Very thankful I work with so many amazing people. My very good friend Rebecca’s birthday fell on a Monday this year. 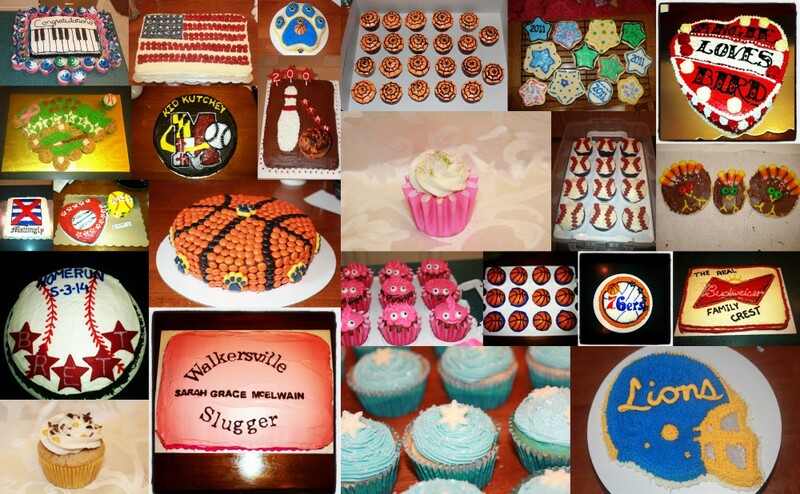 But that was fine because on Sunday, I was busy baking her a yummy cake. She is a big fan of White Russian cupcakes and a White Russian cheese cake I have made previously, so I wanted to stick with that flavor theme, but try something different. The recipe is pretty straight-forward and the time for cooking didn’t require any adjusting. When it was still in the pan right out of the oven, I brushed on some Kahlua to let that soak into the cake. For the glaze, I don’t know how they got it to look so white in the inspiration photo because the Kahlua gives it a light mocha look. There was PLENTY of glaze — I feel like you could cut the glaze recipe in half and still be fine. Also, I would have waited for the cake to cool a bit more before applying the glaze. My friend took some of the cake to work, where she said it received rave reviews. Cheers and Happy Birthday, Rebecca! Family isn’t just what you’re born into. For those of us with sports-playing kids, it’s the friends you make as you bond with the parents of the other kids on team. That has never been more true than for my son Alex’s travel/All-Star team that he has been a part of since 2010. And when your family needs you; you and the other team moms respond. Homecoming weekend, one of the team moms since 2009 (whose son went on to play on a different team this year) needed help. She had been in the hospital earlier in the week with internal bleeding. She is a survivor of triple negative breast cancer, so this new situation caused concern. While she was discharged a few days later, she was still not feeling 100%. 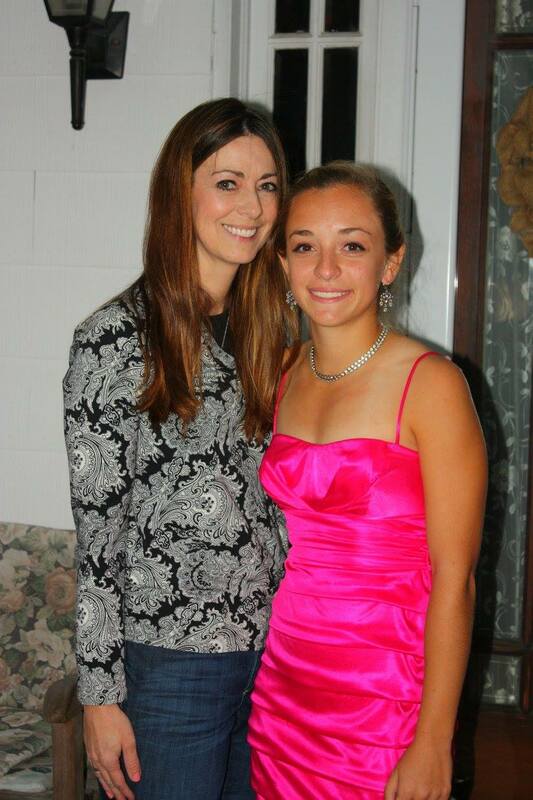 However, a few weeks earlier, she had offered to host a number of her daughter’s classmates for dinner prior to the Homecoming dance. The girls were all going stag, but they were still making a night of it. Good for them! I won’t go into a lot of detail, but let’s just say the parents of those other girls — even knowing my friend’s health situation — well, some of them still expected her to host the pre-dance dinner and didn’t offer any assistance. Uh…WTF? While that’s not OK, my friend is just too nice to call people on their lack of manners. But have no fear — the baseball moms came to the rescue! That Saturday, a group of us prepared dinner, make desserts, and one mom who was out of town ordered lovely flowers as a centerpiece. There was a group of us who arrived early to set up and prepare the dinner, another group that helped serve, and another group that stayed to clean up. I made dessert (of course!). The school colors are blue, gold, and white. 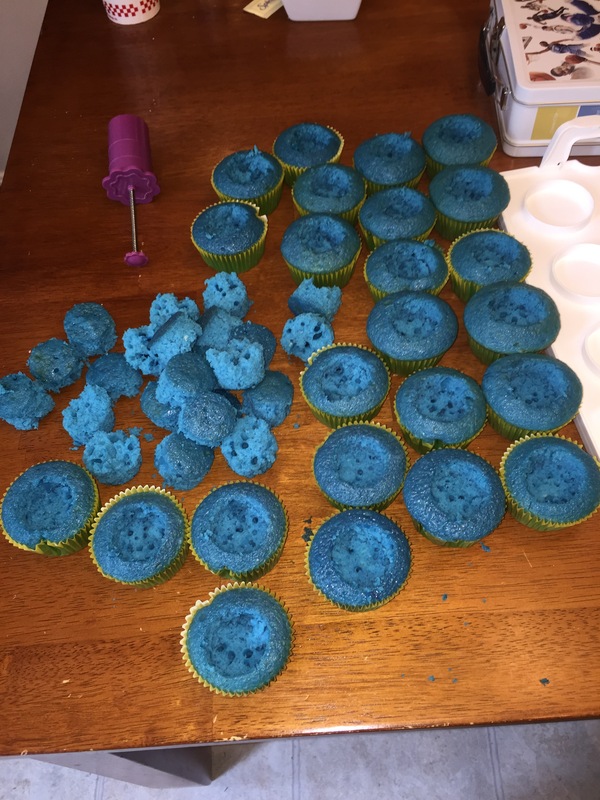 On the menu where blue cupcakes. Since it was short notice, I didn’t make them from scratch. 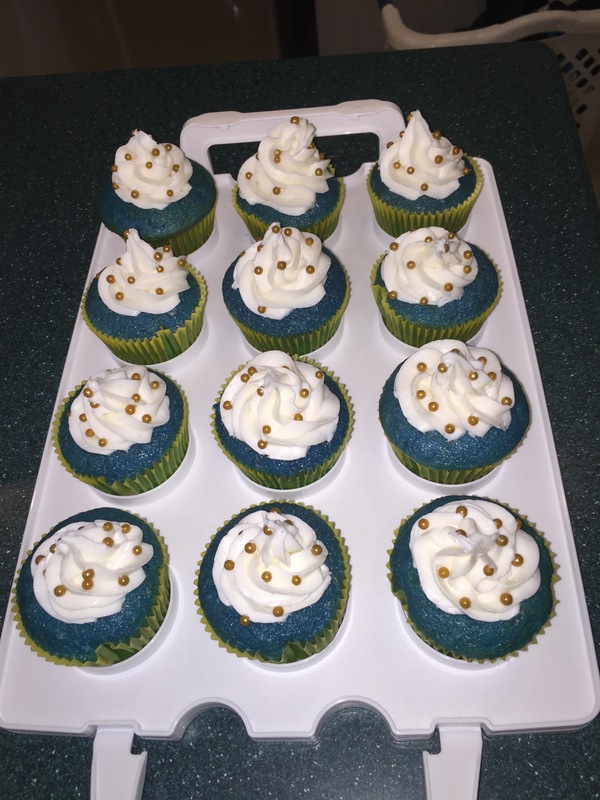 I used a white cake mix and added royal blue gel. I used a cupcake plunger to carve out a space for golden yellow frosting. The golden yellow frosting was a “hidden” treat, because I topped the cupcakes with a white butter cream frosting swirl and gold sugar pearls. Only 7 girls were coming to the dinner, but I made plenty for the host and her family to enjoy. I love that our group of sports moms did not hesitate for a moment to make this Homecoming special for our friend, her daughter, and her daughter’s friends. My friend now undergoing further procedures and tests based on the initial results of her stay in the hospital. If you’re the kind who believes in prayer, auras, kismet, karma — whatever. Send some of that good stuff her way!